Perinaldo. Ideal summer retreat! 1 hour to Nice and 15 km to the sea. 2 bedrooms, 2 bathrooms, 3 WC, sleeps 4. Large shady patio with sea view. Welcome to your ideal summer holiday nest in Perinaldo! You have chosen the perfect spot for spending your days off a comfortable 25 minutes’ drive from the sizzling seaside and a few steps away from the fresh mountain breeze that accompanies your walks in the neighboring hills and valleys. The privacy of the house is undisturbed by the closeness to the center of the typically cobblestoned streets of the picturesque village of Perinaldo. Three rooms, a kitchenette, an outdoor kitchen and an outdoor living room is all at your disposal once you book your stay. French windows lead from the rooms into an ample outside living area on both floors, with stunning views over the French Alps and Mediterranean Sea. Upstairs you can find the indoor living room with TV and apple TV, the kitchenette and a bathroom with toilet and shower. The wooden oven is placed in between the kitchenette and the living room. Downstairs there are two bedrooms, both with terrace entrees, one with a stone fireplace and one master-bedroom with shower and toilet adjacent to it. Large French windows allow for the sunbeams of the afternoon sun to enter the rooms but the morning rest remains undisturbed unless for a few birds songs in the valleys below. Still downstairs, just outside the two bedrooms is the large open-air living room with a cozy sofa and sunbeds. The sofa and comfortable armchairs under the wooden roof that also covers the outdoor kitchen and dining area. A guest toilet services this outdoor living. Entrance to the house is on the downstairs level through a beautiful grape wine covered large pergola that leads to the outdoor kitchen and dining area. On the same level, beyond the loung area is the first terrace with another open air dining area (seating for 14 people) with a stone bbq. On the first terrace you can also enjoy the fantastic views while using the outdoor shower. One terrace level up, You can sit and inhale the great mountain view on a small stone patio under a large fig tree. On the third terrace level you have another fig-tree, a rosebush and loads of herbs. Peppermint, parsley, rosemary, they all grow naturally on this terraced area. Walk to the end of the plot to take a look at Apricale from above, such an amazing view! The house is comfortably furnished and feels like a home. Well equipped kitchen, loads of books, radio and I phone docking station. •Breakfast in the sun – Buy your croissant at the bakery and brew your own coffee. Serve it on the porch upstairs, in the first rays of the sun, with an amazing view of the wakening valley. What better start for the day? •“Condition the air” Keep the perfect temperature during the day by closing the curtains in the living room and dining area to keep the heat out for a fresh evening. •Parking. Space is limited in the town center thus parking is a sensitive issue so please try to follow the “pattern” of narrow parking that the villagers apply. You’ll be friendly received and appreciated by all. •The sink in the outside kitchen only has cold water. •The washing machine heats its own water, put dial on Sale 60. This cycle takes about 2 hour. •Trash… The rubbish can be put in the green bin at the top of the street. There is also a recycling unit by the Cassini monument 300m from the house. Anywhere in the house or the garden, the silence is profound. In the morning to catch the first rays of the sun take your book upstairs on the terrace. In the afternoon sit in the cozy sofa in the extended living room and relax in the last rays of the sun after a long day hiking or after the beach. No parking at the house, there is a 2-10 minute walk to the house from 'city' parking. The path is a bit steep so would recommend to pack light. Living the relaxed and picturesque mountain village life with a close distance to beaches and larger cities. House offers magnificent views of both sea and mountains. Located in a very private location but still walking distance to shops and restaurant/bar. Available in the kitchen on the first floor. Seating/eating area for 2 people. Covered area. Eating area for 5 people. Lounge area for 5 people. Nearest Golf course in San Remo. Welcome to your ideal summer holiday nest in Perinaldo! You have chosen the perfect spot for spending your days off a comfortable 25 minutes’ drive from the sizzling seaside and a few steps away from the fresh mountain breeze that accompanies your walks in the neighboring hills and valleys. The privacy of the house is undisturbed by the closeness to the center of the typically cobblestoned streets of the picturesque village of Perinaldo. Mi casa es su casa” Three rooms, a kitchenette, an outdoor kitchen and an outdoor living room is all at your disposal once you book your stay. French windows lead from the rooms into an ample outside living area on both floors, with stunning views over the French Alps and Mediterranean Sea. Upstairs you can find the indoor living room, the kitchenette and a bathroom with toilet and shower. The wooden oven is placed in between the kitchenette and the living room. The sofa can be turned into a double bed in the evening. We had a relaxing holiday in village of Perinaldo. We had a relaxing holiday in village of Perinaldo. The place is very unique with a rustic look. A lot of sunshine in summer time. The village is beautiful and old with history. The coffee, cheese and wine was amazing. The place is located in the countryside so if you are looking for a nice relaxing area with friendly local people this is perfect. great that you had a good time in perinaldo and look forward seeing you next year! Fantastic holiday home with great views of the ocean and the mountain. Such a cozy place to have a vacation and forget the rest of the world. Will come back here again. thanks for review and I hope I c u back in Perninaldo next year. Cheers! Really nice stay. As always. I´ve been to Perinaldo many times and I always stay in this house. I think it´s perfectly situated in the outskirts of the village. Just a few minutes walk to the centre of Perinaldo. The house has everything I need for a calm and relaxing holiday. The outdoor kitchen is a nice place to cook and hang with friends. I´m sure I will stay here many times in the future. Thanks for positive feedback and looking forward to see you back in Perinaldo! The house had everything we needed for a very comfortable stay and for making our own meals and relaxing on the terrace or playing boule. We took the owner’s advice and moved about with our food and snacks to enjoy either the sun or shade depending on the time of day, and each spot was special in its own way. And the view … it looks great in the pictures but it is even better in person. The town itself is genuine and very friendly, and we fell in love with it almost immediately. Test the local restaurants and bars, we were made to feel at home and we definitely enjoyed the food they served. The center village architecture is similar to that of popular tourist towns such as Dolceacqua, just a bit smaller and without the tourist hype. Our first night there, the town sponsored a free open air reggae concert – dancing to reggae on a warm evening in a mountain village in Italy, how cool is that! The coast was just a half hour’s drive away and we enjoyed the clean and relatively uncrowded local beaches. We also took some nice long hikes starting in Perinaldo, where it was possible to follow dirt tracks along the ridges thus avoiding too much up and down. Thanks for you positive comments and I am glad you enjoyed your stay. Already planning the next trip! The house has gone through some changes since our first stay and now it has got even cozier! It is like home away from home. It has all you need for your stay. 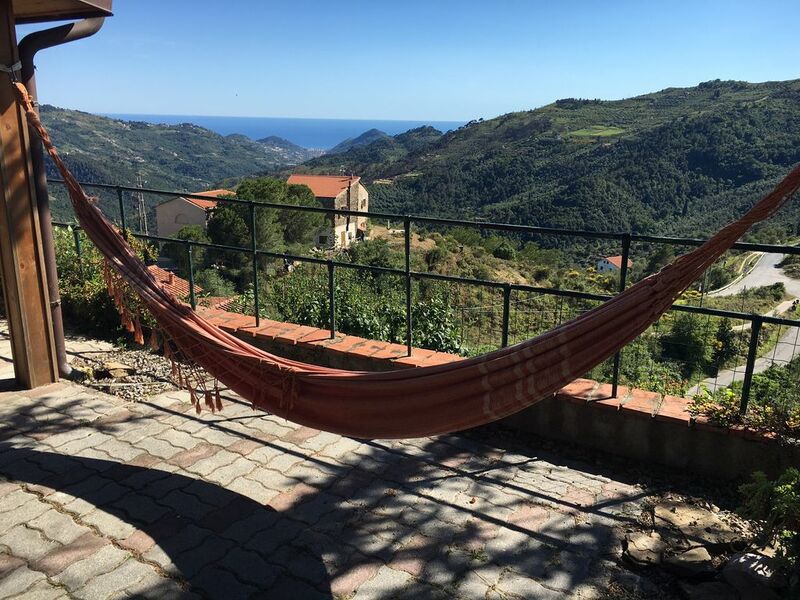 The peaceful surroundings make this a great way to have a relaxing time and the proximity to the coast and bigger towns (as well as to the French Riviera) guarantees a lot of fun, great meals and a way to experience the local life style. The view from the house is always breathtaking! Always. The lack of internet in the house was initially an issue but we soon found out that locals gather around the local bars to use internet while sipping creamy cappuccinos and it became an easy way to socialize and make you feel part of the community… even if just for a few days! There is a lot to see around Perinaldo, on the mountains, on the coast, on local farms and markets... there is enough to please everyone. The weather was very nice pretty much all the time of our stay. It is important to always pack light as there is no garage (although parking is very close) and the access to the house is a rustic path down on the mountain. So you will be kicking yourself if you pack too much! So, packing light is a must! The access is not suitable for prams or wheel chairs! The overall atmosphere, the views, the welcome feeling... It all makes you immediately think about when you can book the next trip! We had a great time in this lovely and friendly village... and surely will go back again for the summer break. Thanks for your positive comments, much appreciated. Looking forward to have you back in Perinaldo soon! The ancient village of Perinaldo lays exactly on the 48th meridian and has been for several hundred years a spot for marvelous stellar observatory. Perinaldo stands atop the ridge between the two first valleys of the Italian side of the southernmost French Alps, giving panoramic views over the spontaneous flora (painting the slopes in a never-ending variety of colors as the seasons come and go) and woods filled with chestnut and pine trees. The far-off outlines of mounts Bignone, Ceppo, Toraggio, Pietravecchia and Grai can be made out on one side; on the other side the eye is drawn towards the sea. Perinaldo looks upwards beyond the horizon towards the blue of the heavens; here the sky is untainted by air and light pollution with some of the clearest views in the area. The mountainous terrain means that winds reach the very highest points, preventing clouds and unsettled weather from staying around too long. These conditions were first appreciated over two hundred years ago by an illustrious son of the village, Gian Domenico Cassini, the first of four generations of astronomers. His reputation stretched as far as the court of the Sun King (Louis XIV) and his discoveries form the basis of modern astronomy: he was the first to identify four of the seventeen moons of Saturn and divide up the rings of the planet (the method he used still bears his name). Cassini also calculated the distance between the Earth and our nearest planets. He measured the time taken for Mars, Venus and Jupiter to complete one whole rotation and described the dust belt encircling the latter. The famous astronomer also lent his name to the modern-day Cassini-Huygens mission to Saturn and Titania. He lives on in the village of his birth through the observatory housed in the former Franciscan convent of San Sebastiano on the eastern outskirts (guided “tours” of the night sky are held here on a regular basis). Adjacent to the observatory are the town hall and church of Sant’Antonio da Padova with its triangular-based sui generis bell tower. Visitors to Perinaldo should stop off at the Castello Maraldi (said to be the birthplace of Cassini and home to Napoleon and General Massena during the Italian campaign) and the parish church of San Nicolò (1489, the date carved in the lintel above the right-hand door, the porta degli uomini). Here one can admire the painting delle anime (of the souls), attributed to the school of Guercino, in the right aisle. On the facade of the priest’s lodgings, formerly the Summer residence and hunting lodge of the Marchesi Doria di Dolceacqua, is an old sundial, built to the specifications of Cassini’s grandson, the astronomer Gian Domenico Maraldi. Closest bar to the house, approx. 5 minutes walk. Great local bar. Food comes in laaarge portions. Also have pool and fussball table. Hotel at the beginning of town. Great for aperitivo on the terrace. Great food! Make sure to get a table outside in order to catch the spectacular views of the valley and ocean! When we are on food and drink subject I have to recommend the wine bar located in Vallecrossia. Great atmosphere in dark valves, good food and exceptional aperitivos for a good prices! Shopping and Restaurants in the neighborhood: Famous boutiques in Bordighera and San Remo. Renowned markets on Thursdays Bordighera, Fridays Ventimiglia and Saturdays in San Remo. French specialties available just across the border in Menton and Monte Carlo. Many well known restaurants in San Remo, Apricale, Pigna and Bordighera. Numerous excellent local restaurants. Menton with it's many famous botanical gardens is a delightful days expedition. For the walkers, there are many well maintained trails on both sides of the border. The rates are all inclusive of electricity, water and linen. Payments can be made in British pounds, Euros or U.S dollars.